Figure 2. Seeds of Lepidium sativum and Arabidopsis thaliana have similar seed anatomy and similar germination physiology. (A) The larger size of Lepidium seeds allows methods for which Arabidopsis seeds are too small, e.g. puncture force experiments. (B) Drawing of a mature Lepidium seed; the embryo is enclosed by the endosperm and the surrounding testa. (C-F) During the two-step germination of Lepidium testa rupture (C,D) is followed by endosperm rupture, which occurs after 16 h under control conditions (E). Due to the microphotographic settings the transparent outer mucilage layer is not visible. (F) ABA specifically inhibits endosperm rupture, the radicle remains covered by the micropylar endosperm even after 60 h incubation in the presence of ABA. (G) Drawing of a mature Arabidopsis seed; the seed anatomy that is very similar to that of Lepidium. 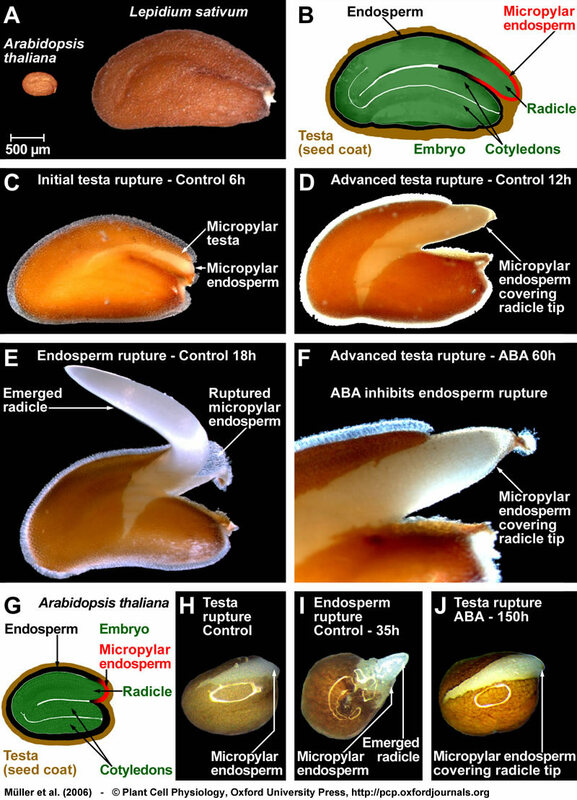 (H-J) Arabidopsis seeds also germinate with testa rupture (H) preceding endosperm rupture (I). Also during the two-step germination process of Arabidopsis, ABA specifically inhibits endosperm rupture (J). Seeds were incubated in continuous light without (control) or with 10 µM ABA added to the medium.